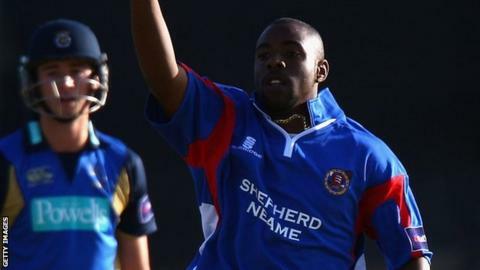 Mervyn Westfield returned to cricket after a ban for spot-fixing by hitting a century for Essex side Frinton. The 25-year-old former Essex bowler can play club cricket following a two-year suspension, but is still banned from professional games for three years. Two Counties Division One side Frinton have taken on the bowler as part of an anti-corruption programme with the Professional Cricketers' Association. He finished the one-day warm-up victory against Harold Wood 120 not out. And the seamer also took three wickets in Saturday's game, a week before the league season starts against Maldon. Frinton chairman of cricket Pat Patel told BBC Sport: "The opposition were not the greatest but it was a good first game for Mervyn. "Considering it was his first game for a few years he did very well." Westfield, who played seven first-class games for Essex, served eight weeks of a four-month prison sentence for accepting £6,000 to deliberately bowl badly in a one-day game for Essex against Durham in 2009. The England & Wales Cricket Board also banned the bowler from professional cricket for five years, but his three-year suspension from club cricket was reduced to two after he agreed to take part in the PCA's anti-corruption programme.